Reprinted from The New York Times by Reuters on February 11, 2019. 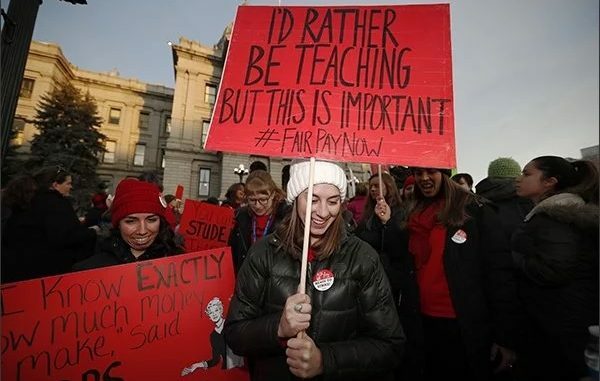 Denver public school teachers walked off the job on Monday to demand higher wages, disrupting classes for some 92,000 students in the latest of a wave of strikes by US educators over the past year. The walkout comes the month after a six-day strike by Los Angeles schoolteachers ended in a deal to reduce class sizes and raise salaries by 6 percent, and follows statewide actions last year in West Virginia, Kentucky, Oklahoma and Arizona. Reprinted from The Washington Post by Thomas Peipert on February 10, 2019.